Wow, Phil, so expertly done. It is such a privilege to see and share this in such spectacular detail. Thank you, Sir! Phil, I must say after seeing your thread I was so impressed I went and became a member. I've got a Centaruo and a salvage I was hoping to do as a V11(should be real salad). I'm looking at your Das oil pump an salivating, been trying to contact Joe Caruso without much luck. Is there a trick to contacting him maybe if I used my cheap translator to contact him in his native language he'd be more receptive? Any way your a true craftsman its a joy to follow this post. I hope I can ask you more then just a few questions. He can take a day or 2 to respond, mention my name and this board so he can keep abreast of his reach. We need guys like him and scudd and Chuck with the skills to make well engineered stuff to keep the Guzzi's running and improving. Joes getting ready to make his own pumps that will be even better the the DAS pump so I'd wait for his to become available. I should be fitting his jackshaft and oil pump gears to the Daytona engine very soon. So some progress today. 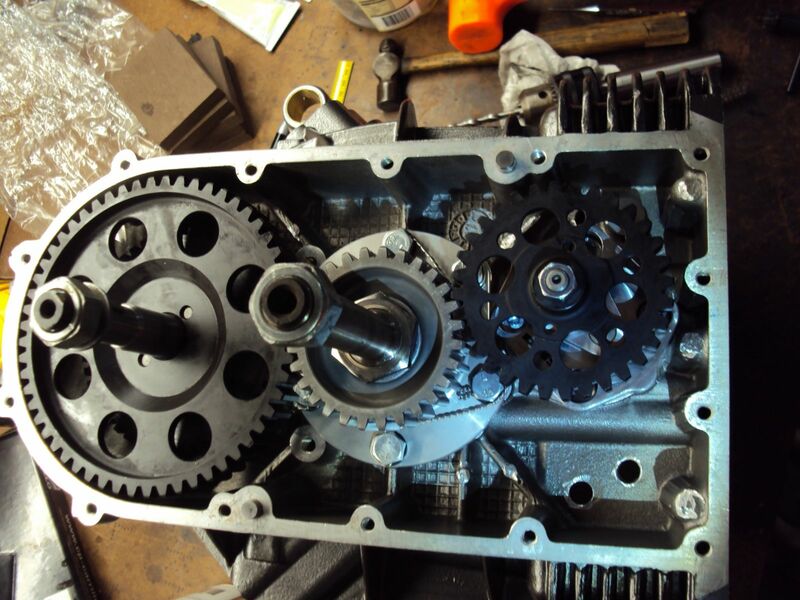 I managed to fit the rods and jackshaft, jackshaft gears and oil pump. My methodology with the rods was to fit the clutch assy temporarily so I could lock the crank with the pin in the position nearest the open sump and then fit the rods and cable tie the small ends together to stop them rotating about as I torqued the big and bolts. I had already torqued the bolts to 50ft/lbs and measured the stretch at between 0.005" and 0.007" so I knew what to set the wrench to to achieve the desired stretch. All worked out fine and I managed to get the mike in there and confirmed the stretch figures anyway. I have a Summit racing big end bolt stretch tool so you can pull the bolts up without the torque wrench and watch the stretch as you pull them up but it wont fit in the Guzzi cases so I did it the painful way. One interesting thing was that I noted when fitting the jackshaft ignition trigger phonic wheel that it comes quite close to the front main bearing flange. I pulled out the old front main and sure enough it had been shaving material off it. This is what happens when you run the old style jackshaft front bronze retainer without the oil reliefs. 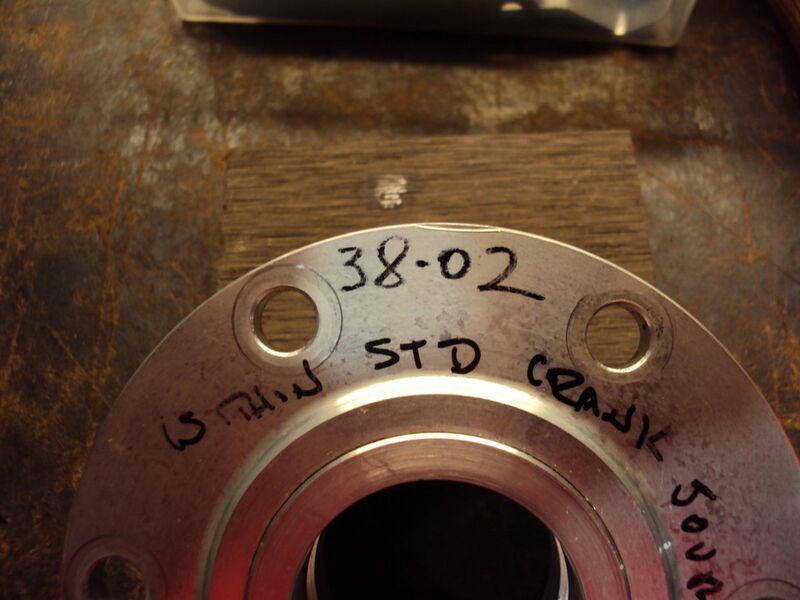 They wear quit badly then the shaft can move rearwards and the phonic wheel starts to contact the main bearing flange. Mine has around 0.9mm clearance and the new jackshaft retainer so I'm expecting it not to wear as badly as the original which had around 1.2mm of wear. I've seen people refit these with this amount of wear funnily enough. 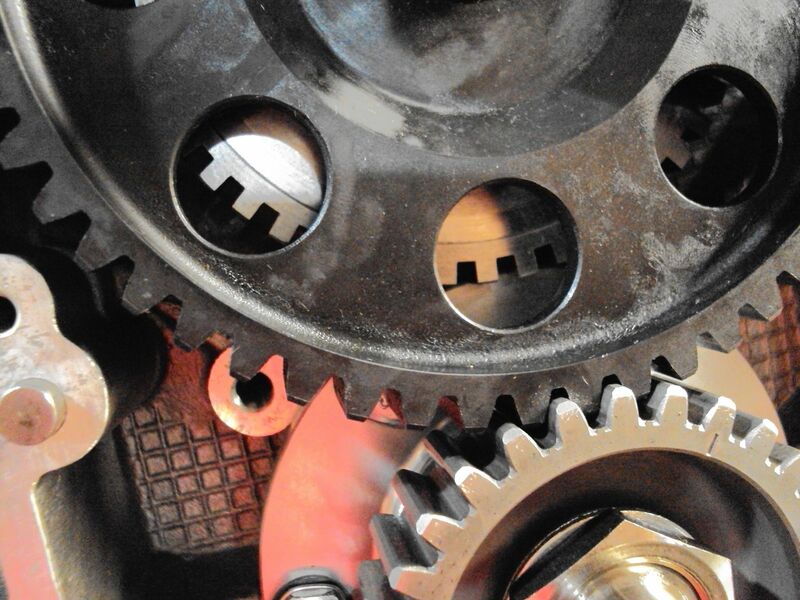 Here's what the phonic wheel does to the front main flange when the cam/jackshaft flange wears. 1200, oclock shaving of the flange. Here is the point of interference. Not a massive issue but it will start making metal when the jackshaft/camshaft front flange starts to wear. Its aluminium though so its not so bad. If you're in the front timing area and your engine has some yards on it it would be wise to replace the cam front flange with the newer type. Here's what a badly worn front cam retainer looks like. Ignore my lock wiring hole drilling practice. Note the recessed thrust face. Its not supposed to be like this although I've seen many people refit these not realizing they are badly worn. You can get the mike in there but for some bolts you need to read it with a mirror. Progressing slowly. 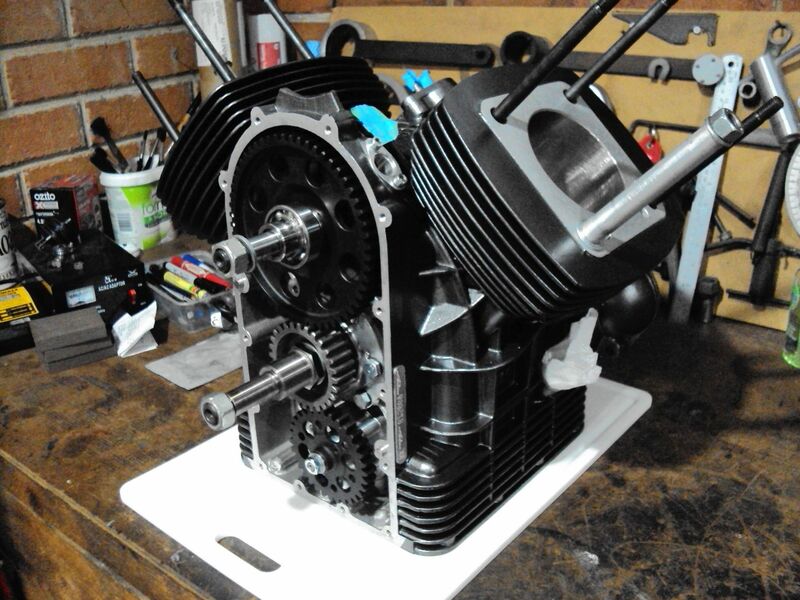 Cylinder and pistons fitted along with sundry cam drive bearings and spacers. New tensioner rollers and bearings fitted and seals replaced although it looks like I need to turn the tensioner rollers around for some reason looking at the shop manual images. No idea why it matters as they are dimensionally the same whichever way around they are fitted. 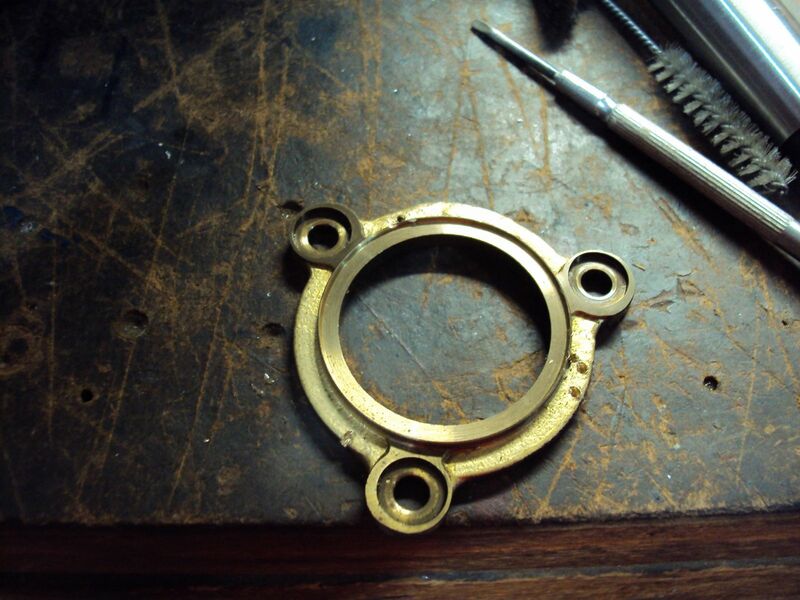 All the ring gaps were measured and fine without adjusting. 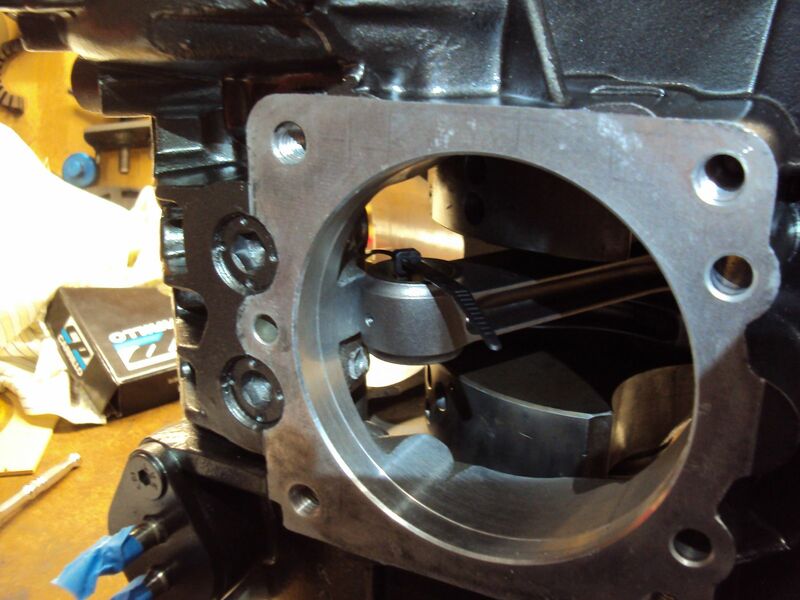 Piston to cylinder clearances were both 0.04mm and cylinder barrel faces given a light lapping on the lapping plate. I'll probably move onto the sump next and leave the heads until last just for the convenience of fitment and having the engine on the bench. A proper engine stand is what I really need. 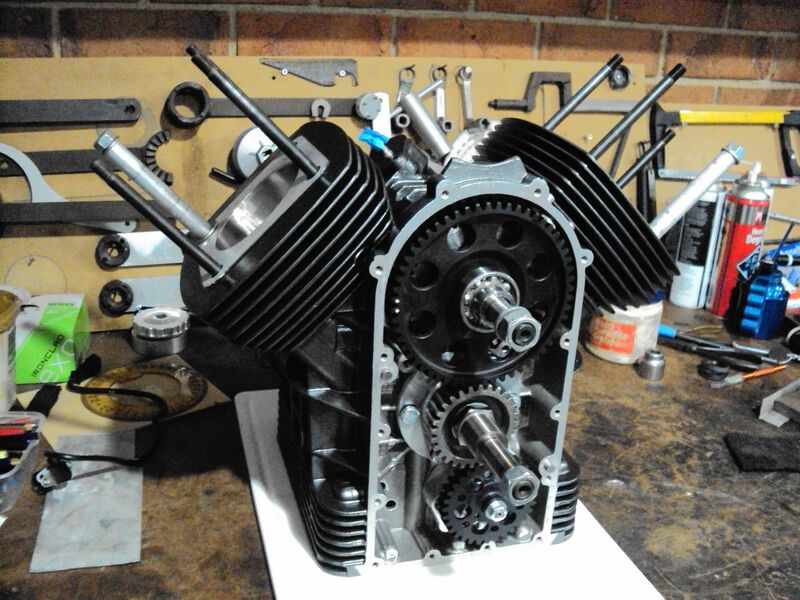 The plan is to have it all together with the exception of the timing cover and oil pump drive so I can spin the pump with a drill and prime the oil system then fit the pump gear and front cover. I expect it to be a bit messy this approach. 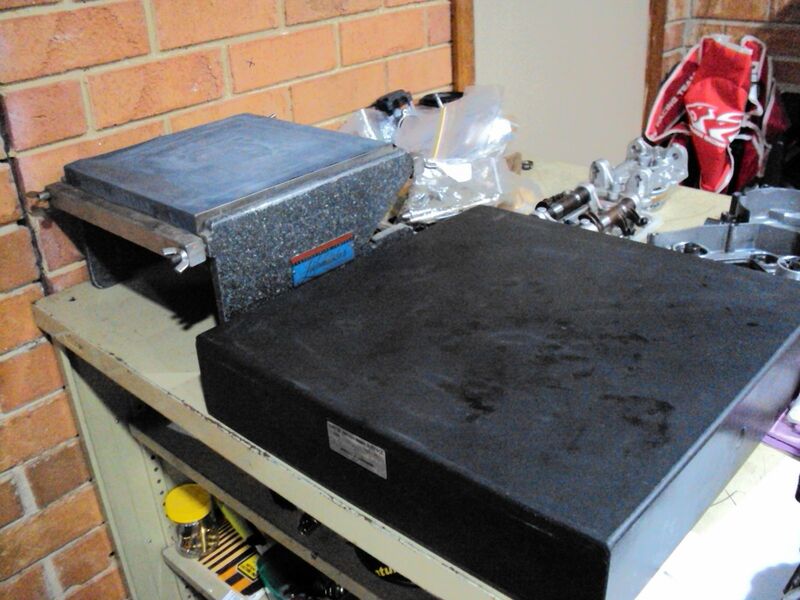 Here's my granite surface plate and my lapping plate. I bought these about 20 years at a closing down auction for an engineering shop. Best money I ever spent. If you see some under the same situation snap them up. they come in handy for many things. Way to expensive to buy retail new, well back then they were. Nice work, I enjoy watching a master wrench doing there thing. Step son Jim in SoCal was rehabbing his garage and found a good sized granite surface plate. When we were out a couple of years ago, he asked me what it was and if I wanted it. (!) Told him I'd love to have it, but shipping would cost more than it's worth. Just the year before, we were out there with the van, and I could have brought it home. I've been there Chuck, should have dealt with something when I was in San Francisco when I was over there but didnt even think of it till I got home. I happened to buy 2 of these granite plates at the same auction and gave one to a good friend with an engineering business. His was nicer looking than mine with a green hue to it and a return around the perimeters. Apart from the obvious dimensional stability compared to steel he pointed out that if you do happen to damage one it will chip and not deform locally so although if damaged its still dead flat. Its a bit like owning a lathe, you dont use it all the time but when you need it you really need it and it nice to have there. 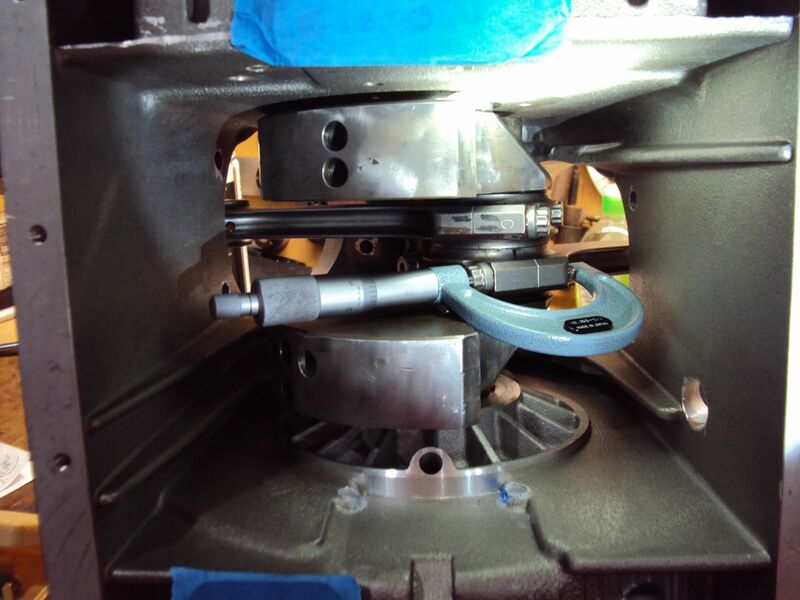 The lapping plate is great to have, many of the crankcase surfaces, heads and barrels get a session on that to clean up the finish and confirm flatness. 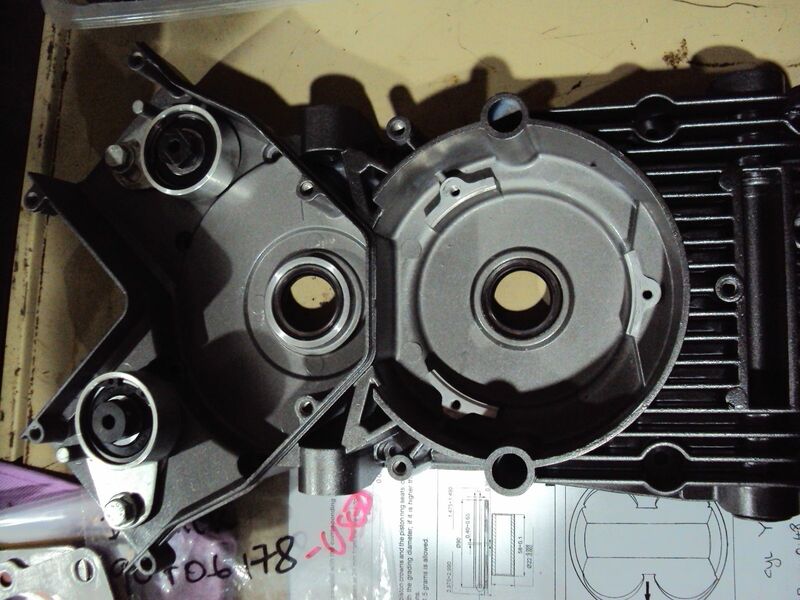 I even managed to use it on the crankcase sump surface, the plate was just big enough for that as well. 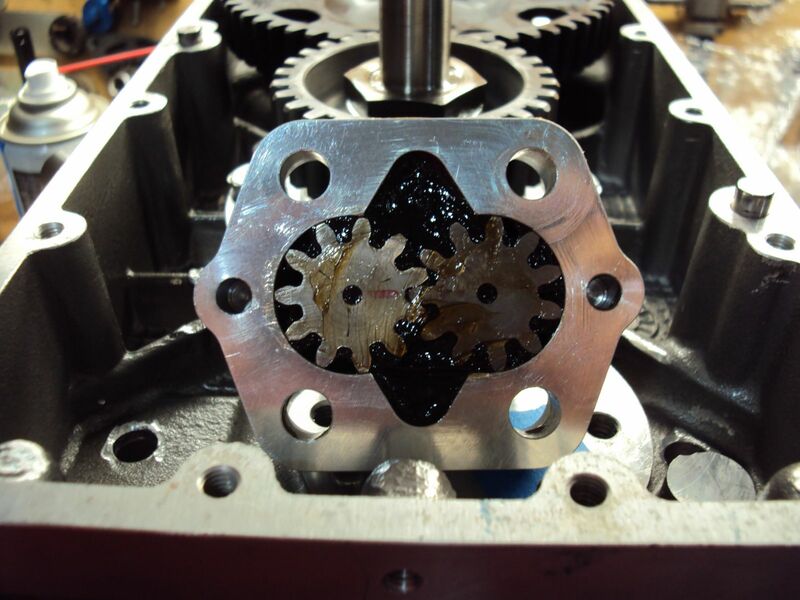 Be sure & spray white grease on the cam drive / driven gears before buttoning up the engine . The first start puts the most wear on any engine part . Would assembly lube also work? Yes I have moly assembly lube which I'll use on the gears same as when I fitted the v11 gears although then I used a very light coat of grease. What I'll also do which I did on the v11 gear install is put 300ml or so of oil into the timing case via the ignition pickup hole. 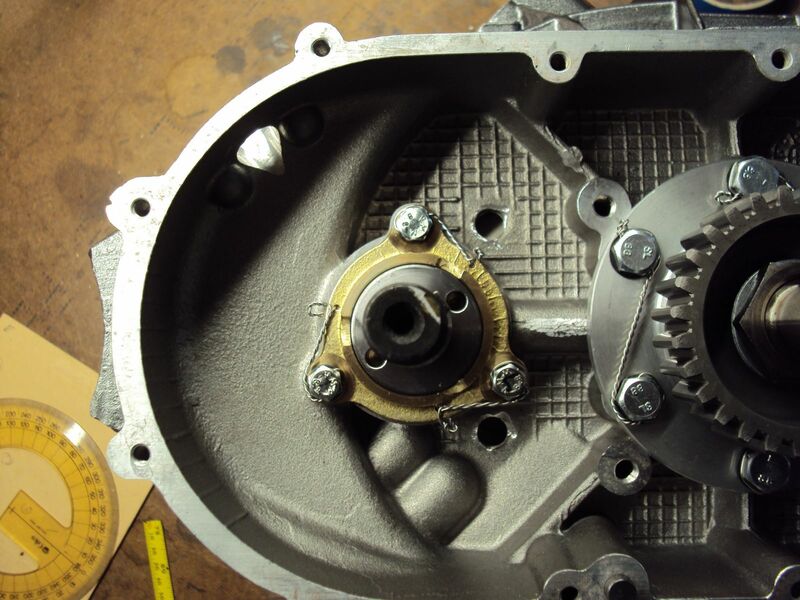 This provides oil into the well area that doesn't drain into the sump which the oil pump gear runs in and when the engine starts the oil pump gear picks up the oil and transfers it to the crank and jackshaft/cam drive gear. Not much of any consequence happening really. I'm looking at the oil pressure relief valve at present and calibrating it. Its leaking badly and wont hold much more than 50 psi (manual says 70psi) It wouldnt cause an issue in reality but I'm trying to get it better than that. I've lapped the valve face to the body and checked it with engineers blue and its faces look good but it still leaks and if you shim it to a point where its getting acceptable then there's too much spring preload and very little travel left. I looked at Chucks old Aero engine thread as I remembered something about this and it turned out we arrived at the same testing procedure and solutions but not the same outcome as yet. I looked on Harpers at a new spring and interestingly their image with a rule next to it shows the new spring is around 1/8" longer than mine so it may well be that the spring has sacked out. I've ordered one so hopefully that sorts it. I find it hard to believe by virtue of its design that this valve wont have some leakage past the seal face before crack pressure is reached. The valve sealing shoulder after lapping (The matt face on the flange after lapping) The inner and shoulder faces have complete contact after lapping. The whole assembly with spring preload washers and shroud. Oil enters from the threaded end of the body and applies pressure to the inside of the sliding valve which is held on the inner shoulder sealing face by a spring pre loaded by the threaded cap on the other end. Crack pressure is in theory adjusted by preload washers. Hmm, couldn't figure out how to add a quote.. but.. it'll have some leakage. From memory 🙄 it starts about 20 lbs or so before blow off. Maybe your spring *is* sacked. Dunno. Charlie says he can get them to motorboat, but I couldn't. If you have pictures that would be great. Always interesting to see how different engines handle the oil pressure release. Cant add images at present. I've uploaded some but like the currently stored images they dont appear in my albums. Probably the switchover to the new system.